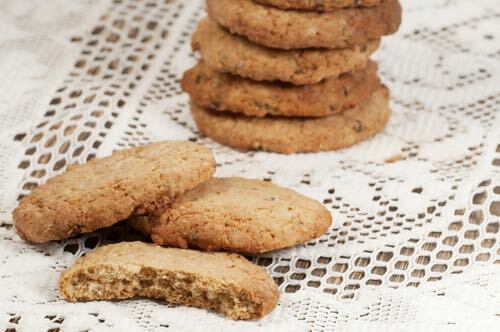 Easy oatmeal cookie recipes were invented during the Middle Ages, and they have remained popular ever since. It's because oatmeal tastes so wholesomely delicious and these cookies are so simple to make. They're the perfect homemade cookie for snacking on or for packing in a lunch. I love to eat these old fashioned cookies after they have been chilled in the freezer for a while, but you can enjoy yours whatever way you want. I won't hold it against you. They will taste absolutely delicious no matter which way you eat them. Did you know that frozen ice cream sandwiches were first made using oatmeal cookies? Try a couple with a scoop of your favorite ice cream between and see how good they taste. Dunk these Oatmeal cookies in your afternoon coffee, or crumble them over homemade vanilla ice cream for a special taste treat. 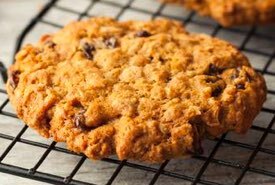 My Grandma and Mom made the best cookies I've ever tasted, and now you can use their proven, easy oatmeal cookie recipes. 1 cup rolled oats, 1 cup white sugar, 1 cup butter, 1/2 cup sour milk (or sweet milk with 1 tablespoon vinegar added), 1 teaspoon baking soda, 2-1/2 cups flour. Roll thin and bake. When baked, fill with date filling to make them Jam-Jams. 6 tablespoons shortening, 1/2 cup white sugar, 1 cup rolled oats, 1/4 cup sour milk, 1/4 cup baking soda, 1 cup and 2 tablespoons pastry flour or 1 cup hard wheat flour, 1 tablespoon baking powder, 1/4 teaspoon salt. 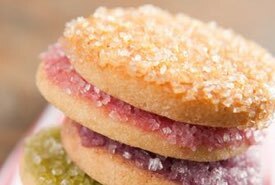 This cookie can be made using all lard or a good commercial shortening, or half white fat and half butter. Cream the shortening well, work in the sugar, and add the rolled oats and sour milk alternately to the mixture. Mix and sift together all the fine dry ingredients (flour, soda, baking powder, and salt) and add gradually. This makes a soft dough which should be well chilled (overnight or for several hours at least), after which it may be rolled to 1/6-inch thickness on a lightly floured board and shaped with cutter. Roll as little flour as possible into the cookies, to preserve their texture. Bake on a greased sheet in a moderate oven 350°F, 10 to 12 minutes. This amount makes about 3 dozen 2-inch cookies. 1 cup flour, 1/2 cup shortening, 1/2 teaspoon baking soda, 2 tablespoons milk, 1/2 teaspoon salt, 1/2 cup brown sugar, 1/4 cup granulated sugar, 1/2 cup rolled oats, 1 tablespoon cinnamon, 1/4 teaspoon nutmeg. Mix dry ingredients and add shortening. Bake on greased pan. 2 cups oatmeal (standard, uncooked), 1 cup whole wheat flour, 1 cup brown sugar, 1/2 teaspoon soda, 1 teaspoon salt, 1/2 cup shortening, 1 egg beaten, 1/4 cup milk, 1 cup nuts, chopped fine [nuts optional]. Mix all dry ingredients together, then rub in shortening with fingers. Add egg and milk mixed together. Drop spoonfuls on well-greased pan and press flat with bottom of spoon or spatula. Bake in moderate oven (350°F) 10 minutes. Makes 40 to 50 cookies. Cream 1 cup butter, add 2 cups brown sugar, and blend. Beat in 2 eggs and 1 teaspoon vanilla. Stir in 2 cups rolled oats; add 2 cups flour, 1/2 teaspoon salt, 1 teaspoon soda. Mix well, and drop on greased cookie sheet. Bake in moderate oven at 350°F for 15 minutes. 3 cups oatmeal, 1-1/2 cups cream, 2 eggs, 2 cups sugar, 1 cup lard, 1 teaspoon soda, pinch of salt, 1 teaspoon cinnamon, essence of peppermint, flour to roll. Soak the oatmeal 1/2 an hour in the cream. Add the eggs, sugar, lard, soda, salt, and cinnamon. Flavor with essence of peppermint to taste. Roll out thin with flour. Spread in tins and bake in moderate oven. Cut into squares while warm. Let stand in tin until cool, then lift out. Three cups raw rolled oats, two cups flour, three-fourths cup sugar, three-fourths cup melted butter, three-fourths cup molasses, one teaspoon cinnamon, one-half teaspoon soda. 1 egg, 1/4 cup sugar, 1/4 cup thin cream, 1/4 cup milk, 1/2 cup fine oatmeal, 2 cups flour, 2 teaspoons baking powder, 1 teaspoon salt.